Cognitive dissonance happens when you are confronted with a truth that conflicts with your self-image. To reconcile the conflict, your brain automatically triggers an hallucination to rationalize-away the discrepancy. To be clear, that is the way normal brains work. 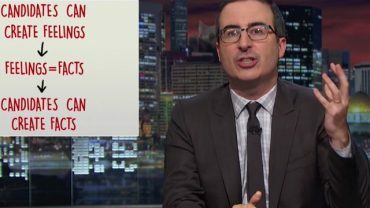 Cognitive dissonance is happening to all of us on a regular basis. It’s just easier to spot when it happens to someone else. 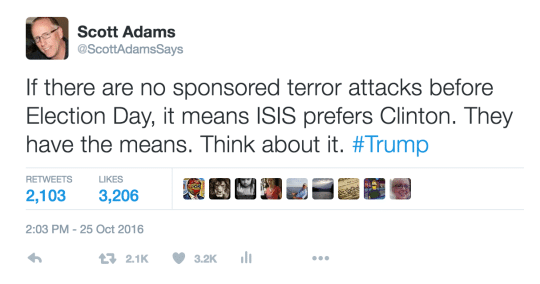 I engineered the offending tweet to make the point that ISIS appears to prefer a Clinton presidency. That puts Clinton’s supporters on the same side as ISIS, at least in the narrow sense that they might prefer the same candidate. That creates a conflict between Clinton supporters’ self-image as good people and the uncomfortable reality that they might prefer the same candidate as ISIS. If my point is credible, the predicted result is that it would induce cognitive dissonance and a literal hallucination. 1. Trump gains popularity when people are thinking about terrorism because the public perceives Trump to have the stronger anti-terror position. ISIS would have learned that by watching the reaction to earlier terror attacks this year. 2. It only takes one terrorist with some guns and ammo to capture American headlines. 3. It is highly likely that ISIS could inspire at least one suicide terrorist in the United States or Europe between now and Election Day if that was their intention. 4. If Homeland Security thwarts a big terrorist attempt before election day, we would hear about it. So even if an attempt is unsuccessful, we would still get a feel for ISIS’ intentions. 6. ISIS has used Trump’s rhetoric as a recruiting tool, and that makes sense for them while he is a candidate. But a President Trump would actually have power to implement his war preferences, and that’s a different calculation for ISIS. Recruiting is a lower priority than war strategy, so it makes sense that ISIS would prefer the candidate that gives them the best odds – in their opinion – of defending their Caliphate and winning in the long run. Obviously there are no absolutes in this world. Maybe our immigration vetting and security services are already so good that no bad people have slipped in. But that would mean those services suddenly got a lot better than they were earlier this same year. That’s possible, but unlikely. It is also possible that ISIS isn’t thinking about American elections because they are busy defending the Caliphate. But that means the lull in attacks for the past few months is happening for some reason other than influencing our politics. What other reason can you imagine for them to take a pause? Assuming they have the capability (one guy with a gun and ammo) and the motive, why else would they take a break? From the terrorist’s perspective, more is always better. You can see how this line of reasoning would make Clinton supporters uncomfortable. Terror is high on everyone’s list of national priorities, and no one wants to be backing the same candidate as ISIS. So if my point in the tweet seemed rational to Clinton supporters, it should – in theory – trigger them to hallucinate in order to rationalize-away their discomfort in being on the same team as ISIS (in this limited sense). And sure enough, hallucinate they did. Watch the ongoing Twitter battle at @ScottAdamsSays as I trigger the #Hillbullies to annihilate their moral authority by acting on their cognitive dissonance and coming after me in full-bully force. It is good entertainment. You might enjoy reading my book because #Hillbullies is a funny hashtag. How Much Do Republicans Have in Common with Trump?